Setting the bar for water stewardship and recovery for reuse, the Metropolitan Water Reclamation District of Greater Chicago (MWRD) in partnership with Ostara Nutrient Recovery Technologies today officially opened the world’s largest nutrient recovery facility at their Stickney Water Reclamation Plant in Cicero, IL. MWRD’s new nutrient recovery facility is an example of how progressive technology can be implemented to transform a wastewater treatment facility into a resource recovery center, providing significant environmental benefits to the Chicago Area Waterway System and downstream to the Mississippi River and the Gulf of Mexico. Through Ostara’s technology, phosphorus and nitrogen will be recovered to create a high value fertilizer with a process that is both economically and environmentally viable. By removing phosphorus from where it shouldn’t be – in the water – and returning it to where it should be, available to farmers, this facility represents a significant shift in the wastewater industry from treatment to recovery for reuse. MWRD Board of Commissioners President Mariyana Spyropoulos and Environmental Advocate and Attorney Robert F. Kennedy, Jr. were joined by U.S. Environmental Protection Agency Acting Regional Administrator Robert Kaplan; Deputy Mayor of Chicago, Steve Koch; and, President and CEO of Ostara, Phillip Abrary, to officially open the facility following a brief ceremony. Nutrient pollution is among the biggest environmental problems of the 21st century. Excess phosphorus in waterways can cause algae to grow and bloom, creating toxic conditions that destroy aquatic life and severely limit recreational enjoyment of lakes and rivers. Phosphorus is considered a major contributor to nutrient pollution, entering bodies of water from a number of sources including urban water treatment facilities. The MWRD’s nutrient recovery facility will greatly reduce its nutrient effluent load to the Chicago/Calumet river system, upstream of the Mississippi river basin and as a result, will reduce its impact on hypoxia in the Gulf of Mexico. Designed to treat up to 1.44 billion gallons of water each day and serving a population equivalent to 4.5 million residents including the central part of Chicago and 43 suburban communities, the Stickney WRP discharges into the Chicago and Sanitary and Ship Canal, making it the largest water reclamation plant in the world. MWRD’s mission is to protect the water supply source, improve the quality of area waterways, and protect businesses and homes from flood damages while sustainably managing this vital resource for the Greater Chicago area. Facing more stringent regulatory limits affecting effluent discharge permits in addition to a wastewater system that was experiencing an accumulation of mineral in struvite form, MWRD sought a closed-loop and cost-effective phosphorus management strategy. As a global leader in nutrient recovery, Ostara provided MWRD a solution to their challenges. Ostara’s Pearl® process for nutrient recovery, is based on a closed-loop solution where nutrients such as phosphorus and nitrogen in wastewater are recovered to form a high value fertilizer that generates revenues for wastewater treatment facilities while helping meet environmental regulations. Traditionally, when wastewater treatment plants remove phosphorus from their discharge stream, the nutrients are recycled back into their system, creating a new problem of nutrient scale, called struvite. The struvite not only clogs pipes and valves, reducing flow, but requires costly maintenance. Although chemical additives can temporarily relieve struvite problems, it is a costly solution that also generates solid waste requiring disposal. Most wastewater treatment facilities are also facing increasingly stringent nutrient limits, enforced by the Environmental Protection Agency, to reduce nutrient pollution in adjacent waterways. By recovering nutrients from the treatment facility’s wastewater stream and converting them to continuous release fertilizer, Ostara’s technology helps MWRD increase operational inefficiencies by avoiding struvite build up, and protecting the local watershed. The Pearl process can recover more than 85 percent of the phosphorus and up to 15 percent of the nitrogen from wastewater streams before they accumulate as struvite in pipes and equipment. As the largest nutrient recovery facility in the world, MWRD has installed three of Ostara’s Pearl 10000 reactors, with an installed production capacity of up to 10000 tons of Crystal Green per year. The District will receive revenue for every ton of fertilizer it produces. The MWRD’s new nutrient recovery facility will create annual cost savings in chemicals, solid waste disposal, maintenance and power. 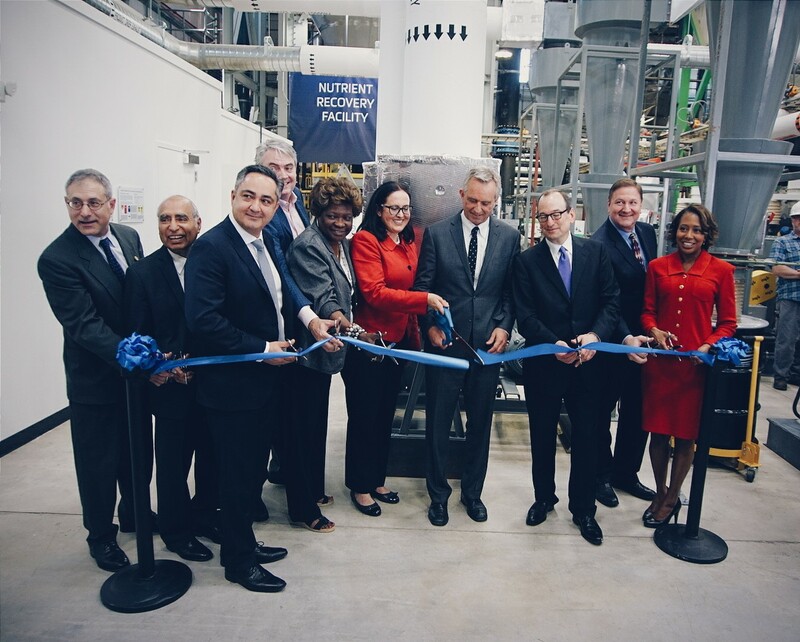 Following the successful commercial start-up of this facility, the MWRD plans to implement WASSTRIP® – a process that turbo-charges the nutrient recovery process and increases the amount of phosphorus recovered by more than 60 percent. As a result, the efficiency of the Pearl process will be further enhanced to decrease the magnitude of struvite scale formation and alleviate operational issues. Ostara helps protect precious water resources by changing the way cities around the world manage nutrients in wastewater streams. The company’s Pearl® technology recovers phosphorus and nitrogen at municipal and industrial wastewater treatment plants and transforms them into a high-value, eco-friendly fertilizer, Crystal Green®. The process greatly reduces nutrient management costs and helps plants meet increasingly stringent discharge limits while improving operating reliability. Crystal Green is the first continuous release granular fertilizer to provide Root-Activated™ phosphorus, nitrogen and magnesium (5-28-0-10Mg), and is marketed through a global network of blenders and distributors to growers in the turf, horticultural and agriculture sectors. Its unique Root-Activated™ mode of action improves crop yields, enhances turf performance and significantly reduces leaching and runoff, thus protecting local waterways from nutrient pollution. Ostara operates multiple facilities throughout North America and Europe. For more information, visit www.ostara.com and www.crystalgreen.com.